During the day on 23 September the Devons rested. At 7pm they paraded as a thunderstorm broke, and they marched through torrential rain to Verquin, the sudden, sharp bursts of lightning a grim forewarning of what was to come. They arrived just over three hours later. After breakfast the next morning, Major Storey called the officers to Battalion HQ to go over their orders for the attack. ‘I sat with Tracey in the window, where it was difficult to hear because of the traffic passing constantly over the cobbled streets below’ – this was John Upcott – ‘We are to be in support of the Gordons & 8th Devons. . . . The final objective is unlimited, but we are to make for Pontavendin Bridge if we get through.’ The rest of the morning was given over to kit inspections and the testing of smoke helmets. In the afternoon Hodgson marched his bombers to Sailly Labourse to draw grenades from Brigade stores. Then there was nothing to do but wait. Now the Companies moved off one by one along the Vermelles Road at fifteen minute intervals, walking in single file through the ruins of Vermelles. Major Storey watched them pass before going forward himself. Being at the back, in support of the other Battalions, the 9th Devons took up positions in trenches just beyond the railway line to the east of Vermelles, some distance from the front line. By 2am they were all in place. The final timings for the attack were received at 20 Brigade HQ at 3.40am, and messages were sent round the various units. There’s a waterfall I’m leaving…. They became friends at school. Two boys, Nowell Oxland and Noel Hodgson, two years apart in age but evenly matched in abilities both in and out of the classroom. They had a number of things in common but the two passions that really united them were writing and a love of Cumberland. For Oxland, younger son of the vicar of Alston, the wild border landscapes were his playground from the age of ten. For Hodgson, who never lived there, the Cumberland fells were home to generations of his father’s family and the one place on earth he wanted to be. Their school careers ran together until the late spring of 1910, when a prank by the pair of them – a bound-breaking expedition – brought Nowell Oxland’s schooldays to an abrupt end. At 19 years old and as Head of School he was expected to show more responsibility, and as the older boy he bore the brunt of the punishment. He was sent down and spent the next year in a crammer making up the qualifications he missed, while Hodgson entered his final year at school. October 1911 saw them reunited at Oxford, in different colleges but still friends, sharing their climbing and fell-walking expeditions in the long vacation. Then came the war. Noel Hodgson applied for a commission in Oxford on 9 August 1914, feeling more apprehension than excitement. War in Europe was already a fact and it was coming closer: he believed Britain had to be involved but had few illusions about where it might lead. From the age of sixteen he had been writing about war’s ultimate futility and waste. Nowell Oxland filled in his army forms at the Oxford Delegacy on 17 August and nine days later his commission came through, to the 6th Battalion of the Border Regiment. This threw Hodgson into some confusion. It is clear from his application form that he had given no thought to the regiment he wanted to serve with. But with Oxland gazetted to the local regiment for Cumberland, and still no news of his own commission, he made a last-minute attempt to serve with his friend. On 9 September he filled in a second application at Carlisle Castle, the headquarters of the Border Regiment. He was too late. Before anything could come of it his first commission came through, to the 9th Devons. By the spring of 1915 they were both nearing the end of their training, Oxland with the 6th Borders at Frensham in Surrey, Hodgson and the Devons about six miles away at Bordon. Oxland’s battalion received their orders for overseas service at the end of June. They entrained for Liverpool, where they embarked on the transport ship Empress of Britain for the long voyage to Gallipoli. It took just over two weeks, passing Gibraltar on the night of 5-6 July and making brief stops at Malta and Alexandria, arriving at Mudros harbour on the 18th. On the 20th they left for Cape Helles and a temporary attachment to the Royal Naval Division. This would give them their first taste of the front lines. After nine days in trenches and on fatigue duties they were moved back, and on 31 July sailed to Imbros, to prepare for their part in a large-scale attack. They left Imbros at 5 pm on 6 August, landing at Suvla Bay shortly after dawn the next morning. As divisional reserves the 6th Borders were not in the forefront of the action. They were sent in to the battle at around 5pm on the 7th in support of the 6th Lincolns, to capture a position called Chocolate Hill. This being achieved, at 9am on the 8th they were withdrawn to the beach in preparation for another attack. They moved forward in darkness to a starting position below Chocolate Hill. This time the 6th Borders were to be one of the leading battalions, with Nowell Oxland’s ‘D’ Company in the firing line. The advance started at 5 am on 9 August and began well, but as the men neared the Turkish positions they were to attack they came under heavy enfilade fire. ‘D’ company, on the left, was driven back; ‘A’ and ‘B’ companies, sent in to support, lost all their officers. With the survivors scattered and no support able to reach them, at 11am the Colonel pulled back as many men as he could to a line which they held until the late afternoon; then he withdrew them to a less exposed position. When the roll was taken the next morning he had only 5 officers and 120 other ranks left from the 22 and 696 who went over in the morning. Nowell Oxland was one of the many known to have died. But the precise circumstances would never be certain. The official telegram told his family only that he had been killed some time between 7 and 11 August, and as late as 1918 the official papers in his War Office file still give the date of death as 10 August. That it had been 9 August emerged early on thanks to a desperate search for news conducted by and on behalf of his parents. Their son-in-law, Major Arthur Derry of the Welsh Regiment, was on the staff at Gallipoli: he was told death had been caused by shrapnel. One early story was that Oxland was being carried off the battlefield on a stretcher when he and the bearers were killed by machine-gun fire. Two surviving officers were contacted by a family friend: one said Oxland had been shot and lay wounded, and in the retreat was shot again and killed, the other that he had been shot once in the chest and died instantly. Another described seeing him attending to a wounded captain just as the first retreat was called, and being shot in the head. In the confusion that morning, under heavy fire for the first time and with so many dead and wounded, it must have been almost impossible to take in and remember what was happening, and there were things that families at home would never be told. The adjutant of 6th Borders had lost his brother in the attack, an officer in Oxland’s company. He described going out to look for the pair of them and finding nothing. And there the trail ended. Nowell Oxland’s name appeared in the published casualty lists at the end of August. Noel Hodgson, in France preparing for his own first battle, found it in a newspaper in early September. And though seeing names of friends in the casualty lists had become a commonplace for them all – in one of his war sketches Hodgson captured the moment and the way that feelings had to be suppressed, ‘one cannot mourn them all‘ – still, this death really hit him. He took some moss from the summit of Great Gable that his sister had sent him – a treasured souvenir of home – and set light to it as a symbolic funeral pyre for his friend. When I first read the letter in which he describes this it reminded me of the Viking’s funeral in ‘Beau Geste’: years on I realise that he would have been thinking of Achilles’ pyre for Patroclus. The closeness of Gallipoli to the plains of Troy was a coincidence not lost on a classically educated generation. And so it all begins…. A hundred years ago today Hodgson and the 9th Devons were comfortably settled at Rest Camp no.5 on the cliffs above Le Havre. They had arrived the previous morning after a very rough Channel crossing on an Isle of Man paddle steamer, a long wait in the harbour and a five-hour march. Today was a rest day. The camp had a glorious view of the sea and with time on their hands, men and officers took the chance to go back down to the beach and bathe (there was even a tram to speed the journey). Two years – or a hundred – or should that be thirty…. Two years ago – well, two years and two-and-a bit months, to be precise – I posted here about Noel Hodgson and the 9th Devons in January 1916. I knew then that actually writing the book was going to have to take over from writing about the book – my deadline was rapidly looming into view. So I packed all of January 1916 into that one post, realising there would be no more posts for a long time. But by a curious symmetry I find myself drawn back to post here once again on the centenary of an event that came up in that January post. It was the ‘Alton-Winchester stunt’, which happened during the 9th Devons’ training and told them a lot about the unfathomable nature of army command. It also became part of their folklore. A hundred years ago today, on 9 April 1915, the battalion was still ‘in the war but not of the war‘, as one of its subalterns said. Mid-stunt, they spent the day resting at Alton in Hampshire, having marched there in heavy rain three days earlier from Haslemere, paused overnight and then marched on to Winchester, only to be turned round and marched right back to Alton again, like some bizarre re-enactment of ‘The Grand Old Duke of York’. After their day’s rest in Alton – had someone, somewhere spent the day trying to work out where they were supposed to be? – they were marched back towards Haslemere, finally ending their journey at Bordon Camp, where they would stay until orders came for France. There are times when this book has felt like that march. Deliberate, apparently purposeful, ending uncertain. Over thirty years ago I found a copy of Hodgson’s Verse and Prose in Peace and War in a second-hand bookshop in Bath (£3.50, first edition). In the course of a long search for it I’d amassed a collection of other war poetry and memorial books to other men killed in action – no one seemed to regard them much in those days. But the real prize was elusive. 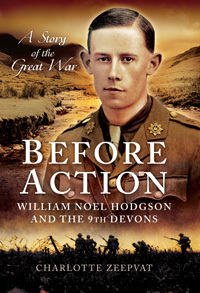 Having been haunted intermittently from childhood by Hodgson’s poem ‘Before Action’ I wanted to know more about him and finding his book, which had seemed like the end of a journey, turned out to be a beginning. I wanted to know more. If the book I wanted to read about him didn’t exist then I would have to be the one to write it. And that set me on a trail of research which was as challenging and exciting and circuitous and frustrating as such things always are – but I never dreamed how long it would last. Thirty years and more. It was meant to be my first book: instead there were times when it felt like the book I would never write at all. And now it exists. Published. That’s still quite hard to believe. In William Nicholson’s play ‘Shadowlands’ C.S. Lewis has the line “We read to make sure we’re not alone.” I think we write for the same reason – I know I do. So hearing now that some people are reading this book that has been part of my life for such a ludicrously long time is a feeling to conjure with – but there’s more. One of the most interesting contacts to date has been from a man who found his father in one of the group photos in the book AND has a story to tell about Hodgson – another little piece of the puzzle. That’s the thing about Alton-Winchester stunts. You never know where they might take you or where or when they might end…. Available to order from Pen & Sword Books. All images and text used on this site are copyright and may not be used without permission in any form.